I have made a vintage card for my Sister's birthday tomorrow, she loves vintage and circular cards so this will be perfect for her. 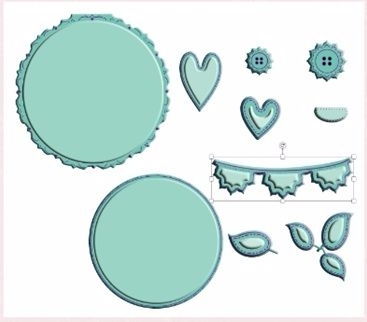 She also likes green :) The image was cut from Pion Design's Grandma's Attic Bouquet image sheet. The papers used are also from Pion Design 6x6 With all my Love from the Where are the Roses Collection and Pendants 6x6 from Pion Design's The Songbird's Secret. The Butterflies and text were cut from the Borders sheet from Where are the Roses collection. I have used the new Lace Irene and added a Wycinanika Back to Vintage Chipboard border. I made a couple of Foamiran flowers and added to a chrysanthemum from the Spring and Summer flower packs. Finished with some 1.5mm pearl spring and diecut trailing leaves in Pion Design Green I. Look at the fab shape of this card, isn't it elegant. I used the NEW LDRS Grace Build a Card Die Set. It's fabulous, I used the largesgt die for the base and the second one for the inner panel and then used the second largest as a stencil to make the third layer. It comes with lots of other elements as shown below and I will be reaching for this set again and again.